Pre-order SONIC ADVENTURE & SONIC ADVENTURE 2 on Vinyl beginning December 5! Both albums Available starting Early January 2018! Featuring Limited Edition Box Set signed by Sound Director and Lead Composer Jun Senoue! The wait is almost over! 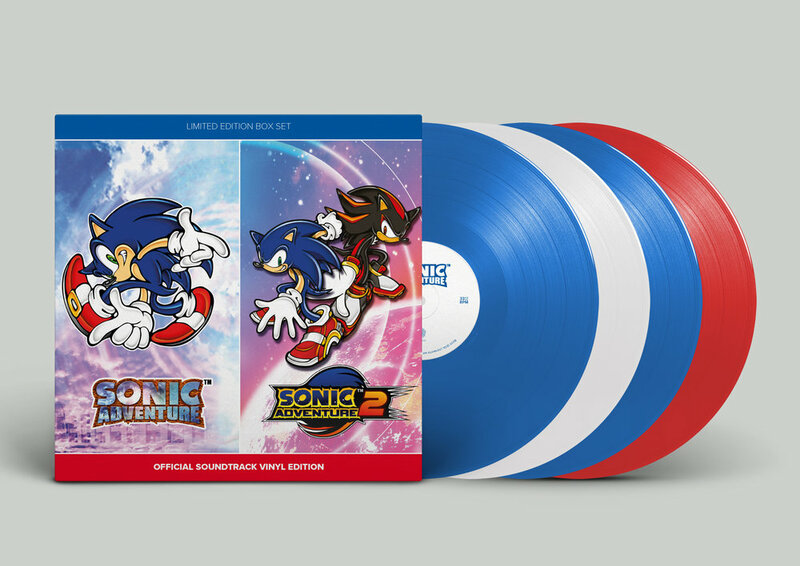 SONIC ADVENTURE OFFICIAL SOUNDTRACK VINYL EDITION and SONIC ADVENTURE 2 OFFICIAL SOUNDTRACK VINYL EDITION will both be available for pre-order starting December 5! The soundtracks will begin shipping to customers in early January. In addition, there will be a SONIC ADVENTURE & SONIC ADVENTURE 2 LIMITED EDITION BOX SET. Retailing for US$100.00 / €100.00, this edition will include both soundtracks enclosed in an outer box with a special design. Each set will include a post card signed by Sonic Adventure series Sound Director and Lead Composer Jun Senoue and is limited to only 300 copies. Note: The Box Set will only be available as a Limited Edition. There will be NO Regular Edition Box Set. 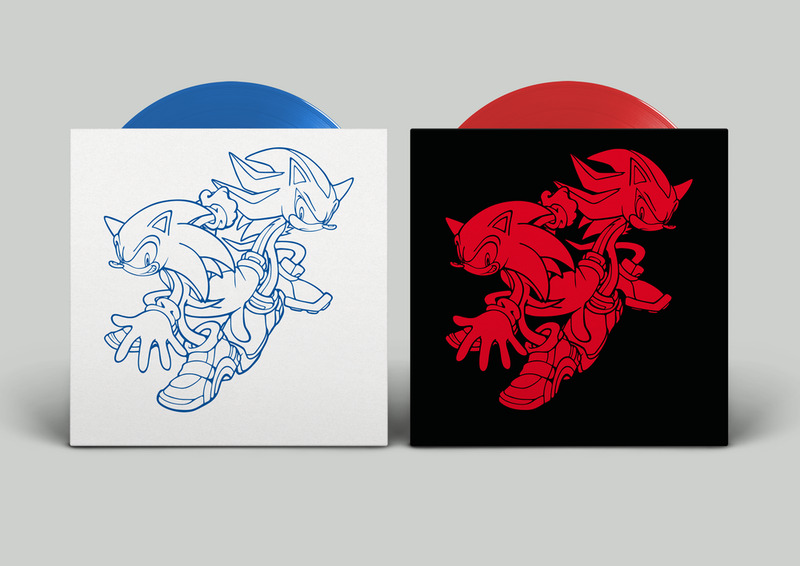 The first pressing will contain special vinyl colors that represent the essence of both games: blue and white 180-gram vinyl for SONIC ADVENTURE and blue and red 180-gram vinyl for SONIC ADVENTURE 2. All pressings after the first will contain standard black 180-gram vinyl. All versions of both albums include a comprehensive booklet featuring a reflective interview with head of Sonic Team Takashi Iizuka and Jun Senoue, as well as Liner Notes by John Linneman of Digital Foundry, song lyrics and character art. In addition, both albums include a free code for the digital tracks via Bandcamp. Inner Gatefold features images from iconic stage "City Escape"
Note: All conceptual images are purely for reference purposes only and may have minor cosmetic differences from the final manufactured product. Pre-orders for SONIC ADVENTURE OFFICIAL SOUNDTRACK VINYL EDITION, SONIC ADVENTURE 2 OFFICIAL SOUNDTRACK VINYL EDITION and SONIC ADVENTURE & SONIC ADVENTURE 2 SIGNED LIMITED EDITION BOX SET will be available at the following two shops on December 5, 2017. For more information on the Sonic series, visit the official website at https://www.sonicthehedgehog.com/, follow the Official Sonic Twitter at @sonic_hedgehog or visit the official SEGA website at http://www.sega.com. Follow Brave Wave on Twitter at @BraveWaveMusic for all the latest announcements. SONIC ADVENTURE was originally released in Japan in December 1998 for the SEGA Dreamcast. It revolutionized the Sonic franchise, bringing everyone's favorite blue hedgehog to a luscious and beautiful 3D world while maintaining Sonic's lightning-fast signature gameplay. SONIC ADVENTURE 2 followed in June 2001, introducing the popular character, Shadow the Hedgehog as Sonic's rival. SONIC ADVENTURE and SONIC ADVENTURE 2 are ⓒSEGA. All rights reserved. Licensed for use by BRAVE WAVE PRODUCTIONS.